Official website of the band CASTRATi from France (Lyon and Paris). We love cats. We play death rock for little children, batcave for young crazy kids and post-punk for old grandmas. Did we mention we love cats ? The websites creator or author is Xavier Bernard. four profiles were found for Castrati.fr in social networks. Among other social networks the website is represented in Facebook, Twitter, GooglePlus and YouTube. The web server used by Castrati.fr is run by 1&1 Internet AG and located in Germany. On this web server 56 other websites are hosted. The language of those websites is mostly german. Only a few websites on this web server are x-rated. 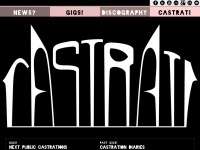 The Castrati.fr websites were developed using the programming language PHP and served by a Apache server. XHTML 1.0 Transitional is used as markup language on the webpages. Indexing the data of the website and following hyperlinks on it is explicitly allowed by robot information.